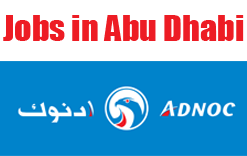 Abu Dhabi National Oil Company (ADNOC) was established on the 27th November 1971 to operate in all areas of the oil and gas industry in Abu Dhabi, United Arab Emirates (UAE). It is a responsible and reliable energy provider dedicated to maximizing the value of Abu Dhabi’s hydrocarbon resources – for the benefit of the UAE and our customers. As one of the leading oil and gas companies in the world, ADNOC is the employer of choice for those striving for a career in a dynamic and evolving industry. The ADNOC Group is home to dozens of nationalities and a growing base of young professionals and engineers, offering opportunities for growth and development through training and educational programs. Requirements: Higher National Diploma (HND) or the equivalent in relevant subject area. Teaching Certification desirable. Assessor and Verifier award (or willingness to train as such) an advantage.